The Harvard ROTC Aviation Award originated in a suggestion by Joseph Gano, Jr. ’64, who wanted to encourage Harvard ROTC students to pursue careers in military aviation. When Joe was admitted to Harvard in 1960 he nearly declined the offer, because he wanted to fly in the Air Force, and he thought that he would have a better chance to achieve that goal if he went to the Air Force Academy. From the age of nine he had wanted to be a jet fighter pilot. Upon learning that he could enroll in Air Force ROTC at Harvard and go on to pilot training, he decided to come to Harvard. He went on to fly F-102s on active duty. A successful business career and the end of the Cold War enabled him to indulge his love of jet aircraft by acquiring what he described as "very fine, well maintained, low time aircraft … at prices just above scrap value." In 2002 his company owned two MiG-21s and a Czech L-29 jet trainer and was part owner of two MiG-23s. He subsequently acquired a second L-29 and two L-39s, and his company now owns both of the MiG-23s. He has regularly taken his "Warbirds of Delaware" to air shows and has also made them available to the Department of Defense to add realism to jet fighter training programs. Joe has participated in the annual Reno Air Races and Air Show for many years. His company engineered two of the fastest aircraft ever to race at Reno: an L-29, designated "Race 77", and an L-39, designated "Race 2." Curt Brown, a six-time Space Shuttle Commander, holds the absolute record for the course in "Race 77", and Joe holds the record for an L-39 in "Race 2". In 2011 Joe spoke of his hope to continue flying his MiGs until age 75. At that time, he said he could "still pull 10 Gs in a pinch". He attributed his longevity as a pilot of high-performance jets to diet and a weight training program that he had maintained since high school. The anticipated change came sooner than he expected, in November 2013 at Reno, when he experienced a brake failure on landing in one of his MiG-21s, overshot the runway, and was seriously injured. There was no fire, but the aircraft was damaged beyond repair. In May 2014 he said he would give up flying his MiGs but expressed the hope of continuing to fly his L-29s and L-39s. About a year later he had fully recovered, and he resumed flying. 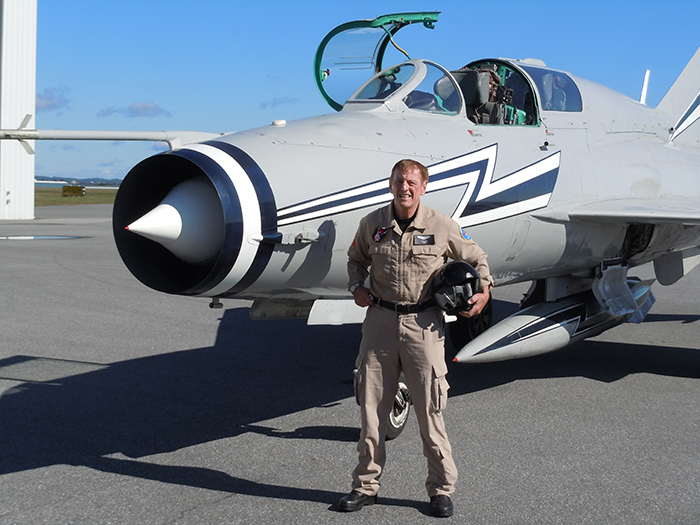 In 2002 Joe proposed offering a flight in a MiG as an award to a selected senior cadet or midshipman. He declared, "I want real pilots," and he asked the directors of the Alumni Fund to develop a set of objective selection criteria. After much discussion with Joe, the ROTC unit commanders, and a lawyer, the directors of the Fund decided that the award should consist of a certificate or plaque plus a cash stipend. Joe agreed with our suggestion that not only pilot and navigator candidates but also candidates for other aviation-related career fields would be eligible. The directors of the Fund annually invite each unit commander to nominate one candidate, and they invite each candidate to submit a one-page personal statement. From the beginning, Joe has offered to each recipient a flight in one or more of his aircraft. Although the Alumni Fund places no restrictions on the use of the stipend, it is intended to enable the recipient to travel to Wilmington, Del., where Joe’s aircraft are based. The directors of the Alumni Fund have greatly enjoyed getting to know the recipients of this award and sharing their enthusiasm.